Ditch Netflix this weekend and get out of the house for some fun, eye-popping events. We've got a spectacular circus-like performance set to classical music, a pop rock group, and a spooky musical for the young ones. Wherever you go this weekend, take METRO to avoid the stress of driving through traffic and finding a parking space. 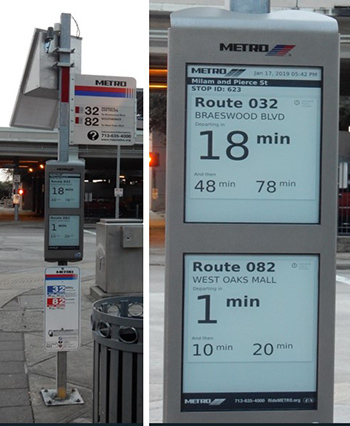 Download our METRO Trip App to find your exact bus and arrival times. You can also buy a ticket using your smartphone by downloading our METRO Q mobile ticketing app. You'll find it's convenient and easy to ride METRO. Event: Cirque de la Symphonie. Be amazed as you watch the gravity-defying acrobats, aerialists, contortionists and jugglers perform live with the Houston Symphony. When: Friday and Saturday, 8 p.m.; Sunday, 2:30 p.m.
Where: Jones Hall, 615 Louisiana St. Event: Vertical Horizon. The band's breakout album, "Everything You Want," sold more than two million copies in 1999 and the title track captured the No. 1 spot on Billboard's Hot 100 and Adult Top 40 charts. Now you can hear this pop rock group in person as lead singer Matt Scannell and band members play familiar radio hits. Grab a bite before the show and get 15 percent off when you mention the House of Blues offer on its website. Where: House of Blues, 1204 Caroline St. Event: "Goosebumps the Musical: Phantom of the Auditorium." Brooke and Zeke can't wait to co-star in their school's musical – until they hear a rumor that the musical, "The Phantom," is cursed. Mysterious events start happening, and no one knows if it's merely a coincidence…or the doings of the Phantom. Based on the writings of R.L. Stine, this musical is recommended for first graders and up. Children under the age of three, including sleeping babies, are not allowed in the theater. When: Saturday, 11 a.m. and 2 p.m.
Where: Main Street Theater at MATCH, 3400 Main St.
Get on board with METRO! This Thursday is "Get on Board Day," a day when transit agencies nationwide are encouraging everyone to take public transportation. Whether you live in the suburbs and work downtown or reside inside the Loop and enjoy an urban lifestyle, you'll find riding METRO is convenient and easy. Get on board for a safer way to travel. Public transit is 10 times safer per mile than an automobile, reducing your chance of being in an accident by more than 90 percent. Get on board to save money. The average household spends 16 cents of every dollar on transportation – and 93 percent goes to buying, maintaining and operating cars. Take public transit and live with one less car – you'll save almost $10,000 a year. Get on board to reduce your carbon footprint. Public transportation saves the United States 4.2 billion gallons of gas every year. Communities that invest in public transit cut the nation's carbon emissions by 37 million metric tons annually. Get on board to enhance personal opportunities. Taking a bus or train offers personal mobility and freedom for people from every walk of life. Access to public transit allows you to go to work, school, place of worship, shopping, the doctor's office or a friend's home. A total of 87 percent of all trips on public transit directly impact the local economy. And leading up to "Get on Board Day," we'll be conducting a contest where you'll have a chance to win a gift card to one of our Rider Rewards restaurants. Visit us on Facebook, Instagram or Twitter on details of how to be a lucky winner. This Thursday is also National Take Our Daughters and Sons to Work Day. What better way to show the next generation the benefits of taking public transportation than to take your child to work with you on METRO! Kids five and under ride free, and all students K-12 ride for half price. This is Easter weekend, and if you want some fun activities, we've got free events for the kids – and the four-footed kids, too. From a huge dog festival to an art day for families to awesome performances from international dance companies, this weekend is full of choices. However you choose to relax, take METRO to your destination. Check out our METRO TRIP app to find the exact bus to your location, and find schedules and next-bus arrivals on your smartphone. Event: Puppies for Breakfast. Nobody's eating puppies at this unique festival that brings together all things dog-related, with more than 50 vendors and artists. See the world's largest canine pinata, enjoy a costume contest for four-legged friends and watch Rover roam at a park-wide egg hunt. Free, but a $5 donation to help a local dog rescue group is appreciated. Food and drinks available for purchase. Where: Market Square Park, 301 Milam St. Event: Dance Salad Festival 2019. The Houston International Dance Coalition presents its 24th annual program of world-class performers. See dancers from the Royal Danish Ballet, New York City Ballet and Donlon Dance Collective Berlin. When: Thursday, Friday and Saturday - 7:30 p.m.
Where: Wortham Center, 501 Texas Ave. Event: Sunday Family Zone. Drop in and enjoy games, activities, books and mini-tours of the galleries. This event launches Sunday family days, focusing on a different work of art or exhibition every month. Two storybook circles (1:30 p.m. and 3 p.m.) use exciting tales to connect art with fiction. Free with general admission. MFAH members and children 12 and younger are always free. Recommended for ages 3 plus. When: Sunday, 1 to 4 p.m.
Where: Beck Building, Museum of Fine Arts, Houston, 5601 Main St.
*Routes suggested by Customer Service; individual needs may vary. Are you a student? Ride free all summer! METRO's got a great summer treat for all students: Ride free on our buses and trains all summer long. We're bringing back a summer of fun for you - where you can go to top destinations, explore museums, parks, the zoo, malls and new restaurants by riding METRO for free. Just use your existing Student METRO Q® Fare Card. Starting June 1, when you tap the card, no deductions will be taken off any balance. Tap all summer, and your balance stays intact, while you enjoy free rides. All local, Park & Ride and METRORail rides are free. If you don't have a Student Q Card yet, you can apply online. Or apply by mail. Simply download and fill out this form. You can also visit us in the RideStore at 1900 Main St. or 1001 Travis St. The free rides start June 1 for all K-12, college and university students. Regular, half-price student fares return on Sept. 1. So, get ready to put some sizzle in your summer and enjoy new sights and sounds in H-town. Read more details about free rides this summer. This weekend is prime time for festivals, and we've got two for you – one will show how to keep our Earth green, and the other will immerse you in a multicultural experience. At night, enjoy a Pulitzer Prize-winning dark comedy that inspired a movie. Wherever you go, take METRO for a smooth, easy ride where you can text to your heart's content and not worry about finding or paying for parking. Download the METRO TRIP App on your smartphone, and you'll have schedules and next-bus arrival times at your fingertips. Event: Japan Festival Houston. Experience the culture of the Land of the Rising Sun at this 26th annual tradition that celebrates the rich cultural heritage of Japan. You'll find unusual items to buy, including anime goods, handcrafted jewelry and antique kimonos. Food stands offer Japanese cream puffs, Gyudon beef bowls and crave-worthy ramen. Find out how to become a teacher in Japan, meet an astronaut or make a lantern. And listen to the music of The Yano Brothers. The trio are of Ghanaian and Japanese descent and blend genres to create "Jafrican" music. Free. Participation in select activities require a fee. Where: Hermann Park, 6001 Fannin St. Event: Green Mountain Energy Earth Day. Discovery Green, partnering with Green Mountain Energy and the Citizens' Environmental Coalition, hosts H-town's biggest Earth Day. Come by and enjoy a farmers' market, activities for kids that both entertain and educate, live music and an eco-fashion show. You'll also get to hear Earth Talks, short talks by environmental leaders that will inspire you to work toward a zero-waste footprint. Free. Where: Discovery Green Conservancy, 1500 McKinney St. When: Sunday, 12 to 5 p.m. Event: "Crimes of the Heart." Check out this award-winning play by Beth Henley, an SMU graduate, whose debut play follows the Magrath sisters – Babe, Meg and Lenny - in a dark comedy. The sisters are unexpectedly reunited after Babe shoots her husband because she doesn't like his looks. Middle sister, Meg, comes home from Los Angeles, and everyone forgets Lenny's birthday. Warm-hearted and irreverent, the sisters learn to forgive the past and welcome the future. The play won the 1981 Pulitzer Prize for Drama and inspired the 1986 film co-starring Sissy Spacek, Jessica Lange and Diane Keaton. When: Friday and Saturday, 8 p.m.; Sunday, 2:30 p.m. and 7:30 p.m.
Where: Ally Theatre, 615 Texas Ave.
Hi! I'm Mary Sit, and I am blogging to you from METRO!